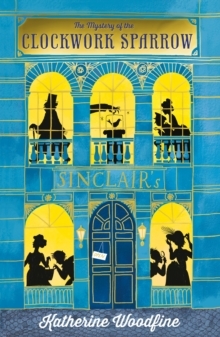 You are cordially invited to attend the Grand Opening of Sinclair’s department store! Enter a world of bonbons, hats, perfumes and Mysteries around every corner. Wonder at the daring theft of the priceless Clockwork Sparrow! Tremble as the most Dastardly criminals in London enact their wicked plans! Gasp as our bold heroines, Miss Sophie Taylor and Miss Lilian Rose, Crack Codes, Devour Iced Buns and vow to bring the villains to justice…The Mystery of the Clockwork Sparrow is the first book in a sumptuous mystery-adventure series for 9+ readers, full of vivid Edwardian period detail. Perfect for fans of Chris Riddell, Enid Blyton, Robin Stevens’ Murder Most Unladylike and Nancy Drew.